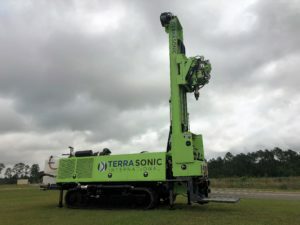 Betts Expands Its Services with the Terra-sonic TSi 150cc Sonic Driller - Betts Environmental Recovery Inc.
ADEL, GA July 12, 2018 – Betts Environmental, a leading environmental and sonic drilling company announced earlier this month its addition of the Terra-Sonic TSi 150cc Driller to its fleet. Betts is very customer driven and its clients had been asking for safer, more environmentally friendly drilling applications. Being in the industry for the past 25 years, Betts keeps a pulse on the advancement in drill rigs and techniques. They have had the opportunity to work in several locations and across different terrains in the Southeast giving them experience with using a variety of applications. Sonic drilling is the most innovative and cost-effective drilling method on the market today. This method has numerous added safety benefits for the field technicians with less hands-on work and much less labor intensive. The Terra-sonic driller can also penetrate surfaces (granite and bedrock) other drillers cannot and does it faster and deeper. We chose to work with Terra Sonic because of their industry knowledge and high quality products. Their products are built with the driller in mind and their attention to detail gives us the piece of mind that we can get the job done.